A modified version of the same displacement map used in the water shader was applied. The graphical artifact at the tip of the flame is the unfortunate result of the randomized ripples not matching up at the edge of the tile. 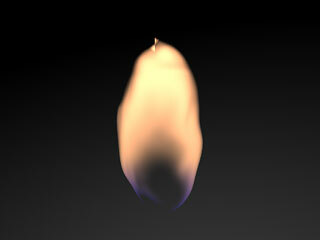 The flame was then placed in an environment and rendered. Expressions were applied to create the up and down movement and the flickering light.